ACCESS takes an active part in driving multiscreen forward. As part of this it shares knowledge through the following white papers. Der Markt für bordeigenes Infotainment sorgt weiterhin für spannende Schlagzeilen – und das aus gutem Grund. Es wird viel in Elektroautos, autonomes Fahren und Smart Cities investiert, und die Revolution hin zu einer automatisierteren und vernetzteren Zukunft schaltet einen Gang höher. In unserem neuen E-Book betrachten wir die lange und aufregende Reise - mit vielen technologischen Stationen auf dem Weg - die uns von der heutigen Realität zu dieser Vision führen wird. Ausgehend vom derzeitigen Stand des Marktes betrachten wir die Auswirkungen von In-Car-Konnektivität auf den Markt: von der Lösung des BYOD-Problems im Vergleich zu eingebetteten Problemen bis hin zur Übernahme offener Standards und zur Einbeziehung der Verbraucher. 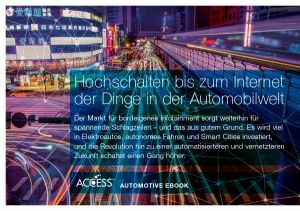 Mit Blick auf die Zukunft beleuchten wir auch das Internet der Dinge und wie es die Automobilindustrie verändern wird. Fragmentation has plagued the multiscreen world for years, but with an unprecedented number of devices and content types available, the issue is now more serious than ever before. In this white paper, we will review the main steps that operators must take to create a multidevice, seamless and secure experience for the consumer. Consumers increasingly demand access to their content both in and outside of the home, supported by the rise of connected entertainment devices. With the emergence of connected cars for further content consumption, now is the time for operators to maximize the potential of their multiscreen services. Multiscreen is maturing at a quick pace, with more content available on more platforms than ever before, enabling consumers to enjoy content wherever they want and however they want. However, this raises multiple questions for operators, including securing the media sharing chain and adapting the security requirements to the plethora of devices used to access and consume video. The joint Intel and ACCESS “Premium Video Gateway Whitepaper” gives an overview of the joint Intel and ACCESS solution that enables operators to meet the content industry’s requirements for universal and secure content access. The solution aims to enable consumer devices to interact and to provide the end user with a seamless, easy-to use solution for all media content while streamlining the operator’s efforts. The way we watch TV content is evolving to include Live Linear, OTT, Catch-Up, nPVR, local PVR, mainscreen, second-screen, tablet, smartphone, companion screens with complimentary content. Amino Premium Connect leverages ACCESS NetFront Living Connect (NFLC), a DLNA Technology Component™, to provide the enablers for publishing, discovering and sharing premium content between the Amino Live Advanced Media Platform and the consumer’s connected devices. Learn more about the Amino Premium Connect Solution in this joint Amino and ACCESS solution paper. With DLNA CVP-2 Premium Video sharing and link layer protection, service providers can offer consumers the ability to stream their favorite television programs and movies to DLNA Certified® products such as digital televisions, tablets, smart phones, Blu-ray disc players and video game consoles. But how can the TV Everywhere environment be secured in order to facilitate content licensing and, ultimately, to maximize the content monetization potential and subscriber ARPU? This white paper by IHS Screen Digest identifies the following technologies as key to monetization: DLNA, HTML5, Security (CAS/DRM). It's interesting that the IHS Screen Digest paper sites insurance as the main driver of present multiscreen deployments. It's our opinion that consumers that have signed up for OTT services have done so because they perceive these services to be more exciting than the VoD services offered by operators - this has clearly negatively affected their VoD buy-rates. In addition, most territories have at least one operator that has, or is about to, launch a multiscreen offering. At which point multiscreen moves from 'insurance' to a 'must have' for other operators. With HTML5 User Interfaces will run equally easily, consistently and securely on a SmartTV, a set-top box, a smartphone or a tablet device, so supporting the multiscreen consumption and interaction of today’s consumers. In its whitepaper, ACCESS explains why HTML5 is key to enable the new kinds of video experience consumers want, allowing TV operators to quickly and cheaply develop and deploy next-generation User Interfaces and web TV contents, manage and protect their brand values, content rights and quality of service while monetizing new opportunities for media distribution. Download the HTML5 whitepaper here. Megatrends are making their mark in the video entertainment industry, affecting device manufacturers, content distributors and consumers alike. These trends include the collision between over-the-top (OTT) content distribution using the internet and pay TV business models, the blossoming of connected TV strategies and the increasing importance of social media in TV. In the past companies in the content production, distribution and device manufacture spaces have for the most part worked together – and they will continue to do so – however, the future will also see these industries increasingly collide, as for example consumer electronics (CE) device manufacturers look to distribute content in the search for incremental and recurring revenues. Download the Multiscreen whitepaper here. If you want to learn more about multiscreen, visit the multiscreen blog.